My lease is up soon and although I like my apartment, I don’t like the building so I’m looking for a new place. Before leaving I figured I’d show you a few details of the space you may not have seen already. 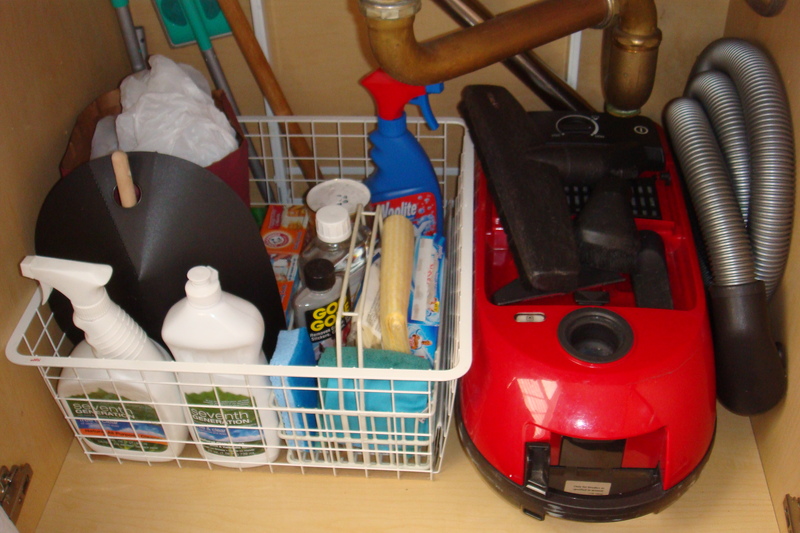 The first is the cabinet under my kitchen sink where I keep all my cleaning supplies including my vacuum and trash. (click on bolded text for links). My cleaning supplies include a general purpose cleaner, glass cleaner, carpet spot cleaner, baking soda, Goo Gone and BonAmi. I like gentle non-toxic cleaners and believe a little elbow grease goes along way. I also use re-usable microfiber dusting cloths which means I don’t need dusting sprays.I invested in a Miele vacuum after being disappointed by small electric broom/dust buster type units. I purposely got a canister as opposed to an upright since they are easier to use and store. You can find them at Gracious Home andBed Bath & Beyond. I purchased mine at a local appliance shop.I take my trash out often and I don’t like large stand alone garbage cans. Not wanting to spend money on any kind of fancy bag holder, I simply used two adhesive hooks (that I already had) to hold a grocery bag. As for recycling, I prefer things not hanging around so I rinse what was used that day and take it out the next time I leave the apartment. Specialty recycling (batteries, cds, small electronics, toner cartridges) go into a small paper bag under the sink until it fills then I take it to a local place that accepts it. I just found out that you have a blog! The photos of your apartments that I’ve seen on Apartment Therapy have always remained in my mind… I adore your organizing and pared down life and keep it in mind as I continue to work through closets and drawers in my apartment to keep only what is useful and loved.An area I need help with is under the sink.. and I’m a visual learner…so seeing the photo you posted of under the sink is quite helpful. When will you be moving?